Are you in the trouble that your iPhone won’t backup to iCloud? Apple provides two ways for you to backup your iOS devices, and iCloud is in it. But many users have met the problem that iPhone won’t backup to iCloud and cannot figure it out. In this post, we will analyze the reasons of this issues and give you some suggestions to solve this trouble. 1.The feature of iCloud backup could be turned off on your device.Sometimes you may turn off the iCloud backup for some reasons but you forget it. Make sure to turn on iCloud backup on your iPhone. 2.The free storage is insufficient. When the files you have downloaded eat up the space of iCloud, you are not able to backup anything to iCloud. 3.A bad network connection would cause the backup failure. It is impossible to backup the data from iPhone to iCloud when the internet you connected is weak. 4.You could be just automatically logged out of your Apple and iCloud ID. 5.Malfunction may occur after an iOS version update. It is probable that the new iOS version you updated is not stable and this would result in the iPhone won’t backup to iCloud issue. According to the reasons that caused iPhone won’t backup to iCloud, we figure out some methods to solve this problem. Have a try of below methods to solve this trouble. For backing up files on iPhone to iCloud, the first thing you must do is to enable the iCloud Backup feature on your phone. To check the status of this function, you can go to Settings and find out the iCloud option and tap in. Then you will see the Storage & Backup, click on it and you can see whether the iCloud Backup feature is turned on or not. If it is off, just tap on button to enable it. And here, if you find that the feature is on, you also can select to turn it off and wait for seconds then turn it back on. A stable network is essential for iPhone backup. Therefore, you need to go to Settings> Wi-fi to turn on the wireless network. If you find that the signal of Wi-fi you connect is not strong and steady enough or you fail to connect iPhone to Wi-fi, you could choose to turn it off and then turn it back on. After this operation, the wireless network may be more stable but if you find that the Wi-fi cannot work well, you could try to reset the network. Apple provides a free space of only 5GB on the cloud to every user.Before wondering why won’t my iPhone backup to the cloud, make sure that you have enough free space on it. Go to Settings > iCloud > Storage to check how much free space is left on the cloud. Most of the times, iPhone won’t backup to iCloud because of a network issue. To resolve this, users can simply reset all network settings. 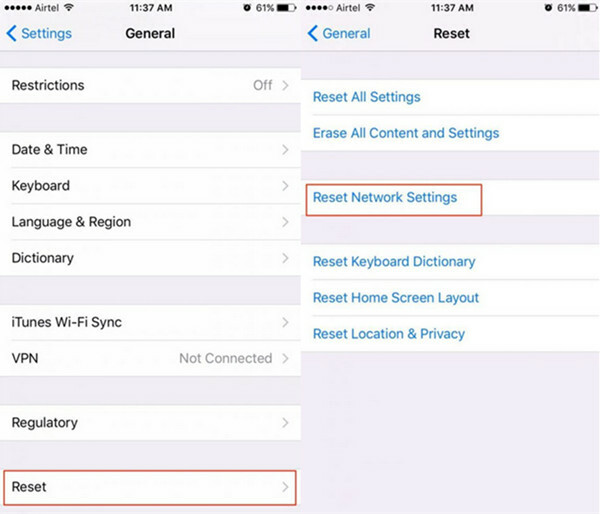 This will restart your phone by resetting all the saved passwords, WiFi networks, and other kinds of network settings. To do this, visit your phone’s Settings > General > Reset > and tap on the option of “Reset Network Settings”. Just agree to the pop-up message to confirm your choice. Another possibility that your iPhone fails to backup to iCloud is that your iCloud account occurs some errors. In this case, you are advised to reset your iCloud ID. You could go to Settings and choose iCloud and then scroll to the bottom to find out the “Sign out” button. Just tap on it and confirm your choice by clicking on “Sign out” as required. And do not forget to log in the iCloud account once again after this operation. If you cannot backup your iPhone to iCloud or you have run out the free storage, you could use the third-party iOS data backup tool, iRefone to help you. This tool supports to backup and recover up to 16+ kinds of data on your iPhone including messages, notes, contacts, call history, whatsapp, wechat and more. It allows you to preview these data as you like on the computer. Run iRefone and connect iPhone to computer. When the program detects your device, click “Start” to go to the backup interface. 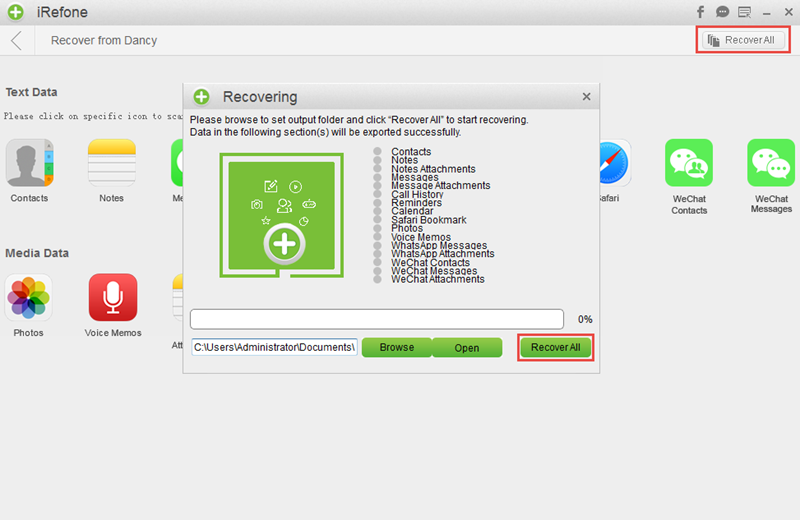 Choose the “Recover All” button on the top right to start the backup of your device. If you want to preview the data or you only want to backup one data, you could select the data you need. This entry was posted in Backup iPhone Data and tagged backup iphone to icloud, iphone wont backup to icloud, iRefone. Bookmark the permalink.